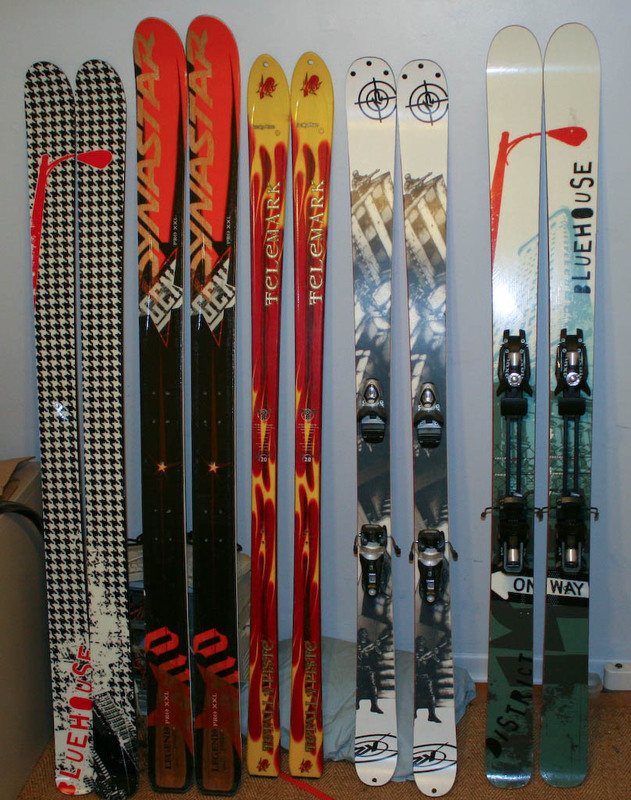 Two years ago, I had only one pair (the skinny tele skis in the middle, below). The year after, I had two active pairs (the 179 PEs to the right, and the BH Districts on far right). First they were mounted tele, now alpine. This year, I have five pair leaning against my wall. Of course, the tele skis haven’t even been mounted in a year and a half (though that may change), and the 07-08 Districts appear to be on their way out the door, for a mere 3 pair of skis in active rotation. Now all we need is some snow. It looks like a wet, heavy storm will be blowing in later this week. With any luck, it’ll be followed in rapid sucession by several more of the same to get a good base in place. < Previous Go Ninja Go Ninja Go! Nice to see two Bluehouses in your quiver. That makes me very happy. Thanks for sharing.